Since 1990, young people have been leading the charge and inspiring others to collect dollars and food the weeks leading up to the Big Game. Teaming up with local partners, these groups give 100% of donations to local charities, changing the nation’s largest weekend of football into the largest weekend of caring. 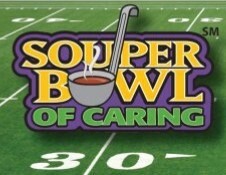 OUR YOUTH will once again be joining in the SOUPER BOWL OF CARING here in Winter Haven. On Sunday morning, February 3, members of our youth groups will be at the doors with Soup Pots following our single worship service at 10 a.m. to collect dollars for our own Saturday Soup Kitchen. And – at 2 p.m. that day, the annual Youth and Geezers flag football game will be played on the soccer fields at Polk State College. The cost of admission (to play or watch) is a non-perishable food item for our Soup Kitchen.